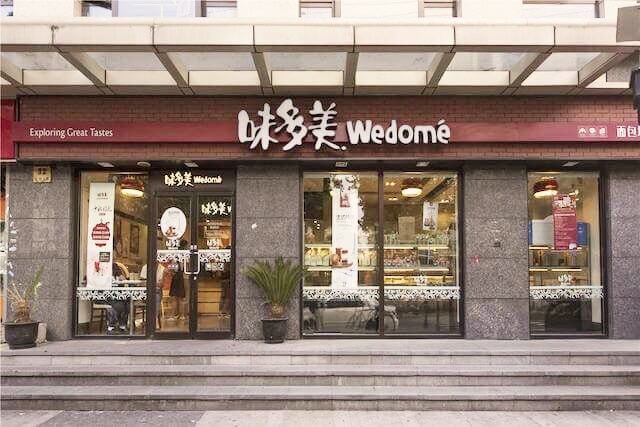 Founded 20 years ago, China’s Wedomé (味多美) bakery has around 380 outlets today, serving 100 000 customers a day, mainly in Shanghai and Beijing. Its founder, Mr Huang Li, a former railway worker, decided to produce French bakery products with a Chinese touch and to use high quality ingredients (some of which are imported from France). Today, he is reaping the rewards of his passion and persistence. Success was not immediate. It took him 4 years to set up a system to expand from 1 to 10 stores, but today, he is opening a new store practically every week. In the future, growth will be achieved through franchises, creating small neighbourhood outlets that will produce their own goods. We know that in China, bread is considered to be a dessert or sweet or savoury delicacy that is eaten both as a snack and at meal times. There is no shortage of opportunity to eat the sweet and savoury products made by the numerous neighbourhood bakeries in China. However, for the first time in 2018, the brand experienced a fall in revenues, despite the new store openings. Late 2018, Wedomé’s owner made a surprising announcement: to do away with sales staff. Retail stores had to adapt to new metrics: rent rises in good locations (+7% in 2018) and wage rises across China (the average wage rise is around 32% and staff turnover is a major problem). This had affected profitability as Mr Huang Li had many employees (10 to 20 in sales and 3 in production per site). Since Chinese society had totally embraced the digital revolution, the businessman was able to set up a pre-ordering process through social networks and online payment systems. Thanks to Koubei (Alibaba service platform), Wedomé bakeries are now referred to as the smart bakeries that need no sales staff. Self-checkout points equipped with visual recognition technology that inform consumers how much they need to pay. Since Wedomé has introduced this smart bakery concept, sales have increased by 8%. It remains to be seen whether this is due to the media coverage of the launch announcement (243 media reports, reaching 55 million people). It has, however, enabled Wedomé to halve its sales force, and retain only service staff (to fill shelves). Other bakery chains including Bread Talk (面包新语), Qian Ji (仟吉) and Qin Yuan (沁园) have also made announcements recently and may also follow suit. It’s interesting to see how fast the digital revolution has changed neighbourhood stores in China particularly compared to how slowly this trend is taking hold in bakeries in France. It’s a well-known fact that waiting time is the top criteria when choosing a lunch location in France, (supermarkets have understood this), so customer flows must be of primary concern to small retail outlets. So when will be able to pay by phone for our ham sandwiches in France like in Sweden or China? The time has come to view bakeries as forward-looking retail outlets (in terms of offer and customer experience), that know how to manage marketing tools and promote digital customer loyalty amongst every generation whether ‘Millennials’, ‘InBetweeners’ or ‘Silvers’. Our future concepts must embrace them all! Tempted to devour Sylvie Amar & Partners’ expertise in the bakery field?